Tonight (Thursday, April 27th), Buff Monster will be at Low Brow in Brooklyn, NY to sign his new Power Pink Montana spray paint cans. At the signing, Buff will also be releasing the first edition of his new Mister Melty Concrete Sculptures! Each piece in this first edition is identically distressed, painted with the Power Pink Montana spray paint, and comes signed and numbered by the artist. 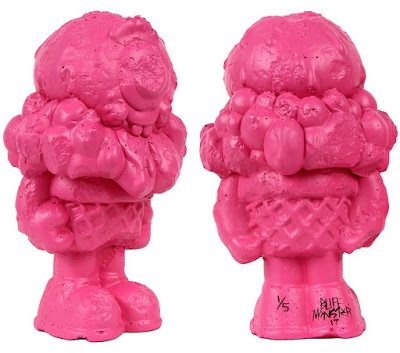 These Mister Melty Pink Power Edition Concrete Sculptures were all cast and painted in Buff’s NYC studio. The 5” figures are an edition of 10 pieces, while the 7.5” figures are an edition of just 5 pieces. Half of each edition will be available at 6-7pm EST tonight at Low Brow (143 Central Avenue, Brooklyn, NY 11221), while the other half of each edition will be available at 7pm EST tonight at the Buff Monster online store.